We have already informed you about this one. A leaked document from what some believe to be Sprint’s inventory notes did say that the LG Lotus is coming in a new, more seductive red version. Indeed, Sprint has now published an official news release, announcing that such version of the phone will surely come. Well, looking at the stock photo, we would not define it exactly as “red”. It is more like purple maybe? It still looks very good, of course. One thing’s for sure, if we were ladies, we would certainly get one of these. However, the specifications have stayed the same: a 2.4-inch main TFT display with QVGA resolution and a modest 2-megapixel camera. Sadly, the carrier has not let us know when the new Lotus will hit the market and at what price. Nice looking phone, looks like the blackberry flip has a competitor. Women won't know the difference. Personally, I think this phone looks ridiculous. I like the new colour, though. Does it come with a razor? Are you obssessed with the phone with a razor? I'm sure that since the red color is just a cosmetic refresh, just as the pink one was done for the Samsung M800/Instinct, the price of the LG LX600/Lotus will be $299.99 SRP, $224.99 on a 1 year service agreement and $99.99 after a $50 MIR with a 2 year contract. 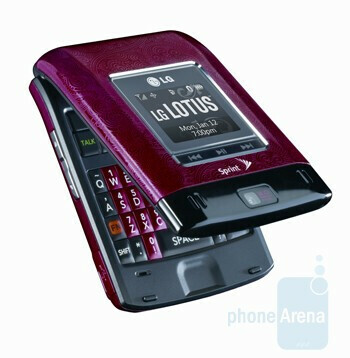 The pattern of the LG LX600/Lotus is the same as trhe purple one. The red LG LX600/Lotus launches on 04/19/09. i can sell your girlfriends (if u have any) the purple lotus on a new 2 year for 79.87 automatic rebates 40$ bill credit:) haha easter baby cheap gift!!!!!! Thank you so much, thats exactly what I was hoping to read on this forum.